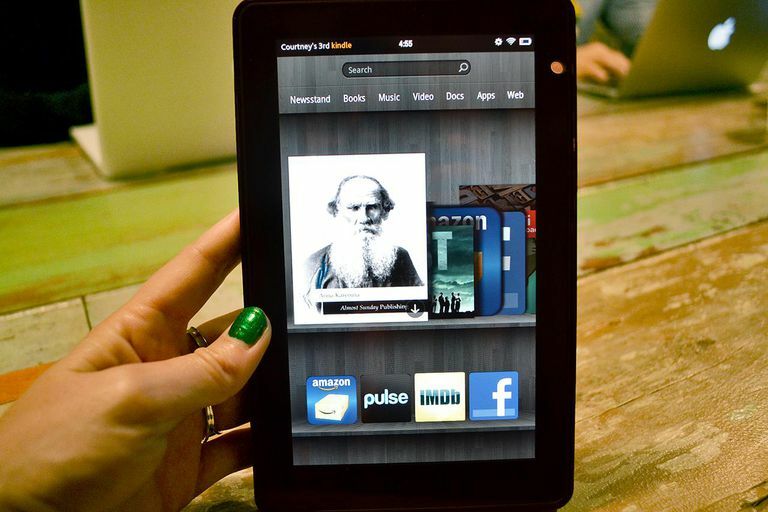 Keep your Kindle Fire up to date by installing Amazon's operating system upgrades when they're released. Periodic updating ensures that your Kindle Fire carries the latest security patches and feature updates. Swipe down from the top of the screen and tap Settings. You can also tap the Settings app icon on your home screen. Go to Device Options > System Update. Look for a message like Your device is running Fire OS [version]. If you already have the latest version installed, you don't need to do anything at all. You can tap the Check Now button if it has been a while since your Fire has checked. Tap the Quick Settings icon at the upper right part of the screen. At this point, any applicable software update automatically downloads in the background. The update is applied after the download is complete and your Kindle Fire is asleep. If you prefer to update your Kindle Fire using your computer, you can. This process isn't as quick as the Wi-Fi method. Visit Amazon’s Kindle Software Updates page. Choose the device you want to update. On the download page, click the link that says Download Software Update. Connect your Kindle Fire to your computer. A device icon for your tablet should show up. Click that device icon and then open the kindleupdates folder. Find the software you just downloaded and drag the file into the kindleupdates folder or copy and paste it into the folder. After the software update has been copied, tap the Disconnect button on your Kindle Fire screen to safely disconnect it. Unplug the USB cable from your computer and continue the update on the Kindle using the following steps. The following will be available on select Kindle Fire models, but not all. If you don't see a Quick Settings or More > Device icon, your tablet will not be able to do the following. Ensure that your Kindle Fire battery is fully charged, and then tap the Quick Settings icon followed by More > Device. Tap the option that says Update Your Kindle to start the update process. If this option is grayed out, you already have the most recent update installed, or the initial file transfer from your computer was unsuccessful. Your Kindle tablet reboots twice to finish the update. Amazon offers specific update instructions for each Kindle on the Kindle Software Update page. If this article doesn't seem to apply to your Kindle version, use the update page to find your specific Kindle and then follow the directions given there.